Paul Goldschmidt watches his three-run home run against Tim Lincecum in the first inning. Paul Goldschmidt realizes his good fortunes against Tim Lincecum could turn at any moment, so he’s the last one who will be caught celebrating a remarkable streak of home runs against the two-time NL Cy Young Award winner. Goldschmidt did it again Wednesday night, showing he has some freak in him, too. The slugger hit a three-run homer and sacrifice fly to pound Lincecum early, and the Arizona Diamondbacks beat the San Francisco Giants 7-3 for a nice lift after a slow start. Gerardo Parra hit a two-run homer and finished a double shy of the cycle, while Eric Chavez added an RBI triple for his first hit in his first start of the year for Arizona. Goldschmidt is batting .542 (13 for 24) with seven homers and 17 RBI all-time against Lincecum, including a two-run homer last week at Chase Field. His latest homer marked the 22nd time an opposing right-handed hitter homered to AT&T Park’s right field. "I was kind of worried it may go foul, but I think the wind actually helped keep it fair. 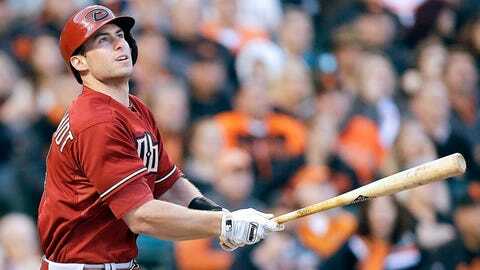 It was right down the line," Goldschmidt said. "You know Lincecum’s a very good pitcher. So you just go up there and try to have a good at-bat and try to hit the ball hard, and fortunately I was able to get one there in the first inning. It really doesn’t change. Try to have a good at-bat, try to keep it simple." Goldschmidt has been such a nemesis for Lincecum, the exasperated pitcher said last week he might have to throw underhanded to try to stymie the slugger. "It’s just unexplainable," Chavez said. "I have no idea." Arroyo was staked to a nice lead early and worked five innings to earn his first win since joining the D-backs in February. He had a no-decision against the Giants last Thursday. The right-hander allowed six hits and three runs, struck out two and walked one. He beat the Giants twice last season, including a seven-hitter at AT&T Park last July 22 with the Reds for his sixth career shutout in an 11-0 victory. Josh Collmenter, who soon could join the struggling Arizona rotation, pitched four scoreless innings of relief for his first major league save. Goldschmidt got things going at AT&T Park again. Parra led off the game with a triple, Martin Prado walked and Goldschmidt sent a 1-1 fastball into the elevated right-field arcade. He added a sacrifice fly in the third, then was booed each time he stepped into the batter’s box in the late innings. "Hopefully, the streak continues," manager Kirk Gibson said. "It’s amazing." Parra connected for his first homer of the year with two outs in the fourth. Lincecum (0-1) lasted just four innings, tagged for seven runs and seven hits. The right-hander received a $35 million, two-year deal in late October to stay put with San Francisco rather than test free agency. He said he might be trying too hard against Goldschmidt. "I just have to start leaning on a little bit more of my strength and not necessarily his weaknesses," Lincecum said. "I know he’s got some holes here and there, but I have to mix up my pitch counts and my pitch routines." Pablo Sandoval went 1 for 4 and is off to a quiet start hitting .143 for San Francisco. Manager Bruce Bochy is confident that even though the Giants have tabled talks about a contract extension for the third baseman, it won’t affect the 2012 World Series MVP on the field. NOTES: After the early struggles by the D-backs rotation, Arizona officials are discussing changes. Gibson expects Trevor Cahill (0-3) to make his next start Sunday, but Collmenter will be stretched out and threw 53 pitches. . . . Ryan Vogelsong (0-0) pitches Thursday for the Giants against Randall Delgado (0-1). . . . The Giants will hold "Farewell to the Stick" night Thursday to honor their former home of Candlestick Park. The NFL’s 49ers played their final season in the venue last year.